In the long list of amazing hitters from the 1930s, Al Simmons was one of best, combining a high average with the ability to smack home runs. However, today he might be one of the least known Hall of Fame members from his era. This list of the top Al Simmons cards will serve to educate collectors as to why they should add some of his cards to their collection and on which of his amazing cards they should focus. 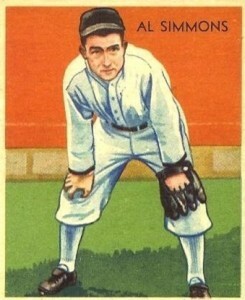 Shop for Al Simmons Cards on eBay. Simmons, along with teammates Jimmie Foxx and Lefty Grove, led the Philadelphia Athletics to back-to-back World Series championships in 1929 and 1930. 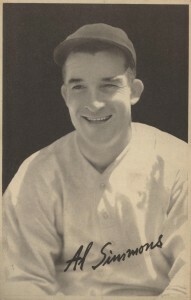 Simmons was known for his incredible batting averages, finishing his career at .334 average and hitting .381 and .390 in consecutive seasons. 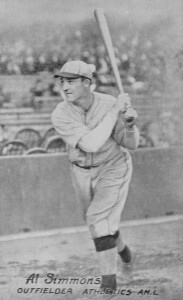 He was the Ichiro of his day by having six seasons with over 200 hits and at the time of his retirement, Simmons held the record for most hits by a right-hand hitter. Al Simmons made many appearances in cardboard sets after his playing days and here are a few of note that didn't crack the top ten list. Fans of the old Philadelphia Athletics franchise should check out card #1 in the 1948 Swell Sport Thrills set which features Simmons along with four other teammates, including Jimmie Foxx and Mickey Cochrane. The 1961 Golden Press Hall of Fame set has possibly the most beautiful Simmons card ever made and you can pick it up for just a few dollars. Simmons also makes several appearances in the baseball stars sets made by TCMA from the late 1970s and early 1980s. You will find a relic card in Simmons' top 10, but those with a larger budget can look for combo relics in Panini National Treasures featuring Simmons and other notable stars like Hack Wilson and Henry Heilmann. As you'll see, many of Al Simmons' key baseball cards are found in some rare and important vintage sets, with many of them frequently reaching high prices. In constructing the top list, ability to locate copies of these cards was taken into account, as well as each card's value. 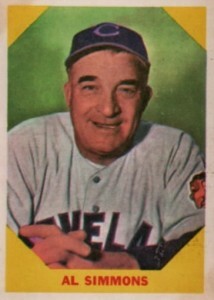 Simmons served as batting coach for the Cleveland Indians for one season in 1950 before resigning due to health concerns in 1951. Fleer included him in both their 1960 Fleer and 1961 Fleer Baseball Greats set. The 1961 Fleer features him as a member of the Cincinnati Reds, a team he only played a brief nine games for in 1939. A sidenote to pre-World War II trading card history that you might not be familiar with is that the Butterfinger chocolate bars that we are still familiar with today issued a set a trading cards back in 1934. These photo cards were available as a bonus for buying their candy products and are much larger than the standard card size today. 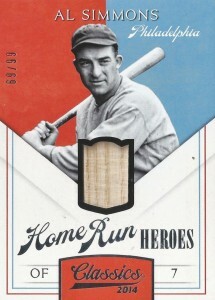 Highlights of the set include Babe Ruth and Lou Gehrig cards and Simmons' card ungraded can be found between $40-$50. Goudey issued these "premium" sepia photo cards in 1939 and in total there are 48 cards in the set. 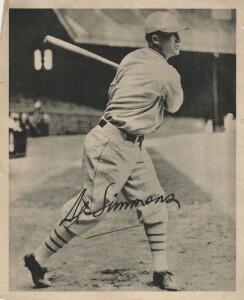 As you can see, Simmons' card includes a facsimile autograph. Al Simmons was born Aloisius Szymanski and simplified his name when he got tired of having everyone mispronounce it. Al Simmons died in 1956 and so there are very few autographs available for him except for an odd cut autograph now and again. As an alternative, several high-end sets have bat relic cards for Simmons and 2014 Panini Classics offers a beautiful example in their Home Run Heroes insert set. 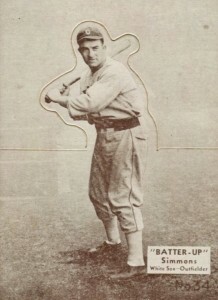 Although Simmons is known for his batting average, notching 30 home runs in a season three times showed he could also hit for power. 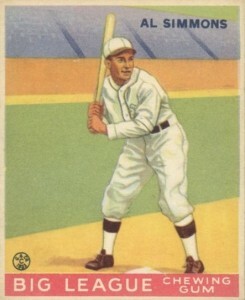 Simmons' Diamond Stars card features him roaming the outfield where he played for most of his career. His #2 card follows his former teammate, Lefty Grove, in the set. What a difference one checklist position makes as Grove's card can be worth five times as much as Simmons' card. 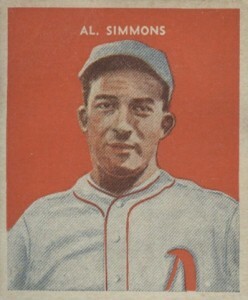 Like many of the cards in the set, you can find blue and green back variations of the Al Simmons card. Exhibit cards were famously placed in vending machines for kids to buy, but this Al Simmons card is something a little different. Exhibit also issued cards designed to be mailed as postcards and some of these even have wording on the back stating that they are not to be placed in the regular vending machines. These postcards have proven to be some of the most valuable postcards ever made as the Al Simmons card reaching prices of several hundred dollars. Along with being baseball cards, the cardboard in this set could also be used a coupon if you were able to collect all the cards in the set. Deviously, the makers of the set, U.S. Caramel, severely short-printed card #16 in the set to limit the number of prizes they would have to give out. Also, when the cards were turned in for the prize they were stamped and/or punched to void them and so many copies of these cards carry noticeable damage. For fans of collecting "rainbow" variations in modern sets, the same thing is possible in the National Chicle Batter-Up set. Low-numbered cards, like Simmons, can be found printed in such colors as purple, green, and blue. 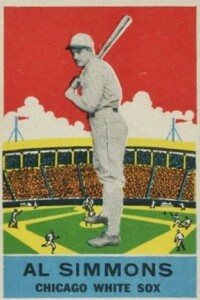 The DeLong Gum Company issued a one-off set of cards in 1933 and their iconic design of having giant-sized players standing in the middle of their baseball stadium became famous with collectors. The reverse side offers tips on how to pick a batting stance and they recommend that you try each style until you find something that works. While Simmons' card value can't hold a candle to that of Lou Gehrig's card from the set, near-mint versions can reach as high as $1,000. Simmons' nickname throughout his career was "Bucketfoot Al." The term "bucketfoot" batter referred to his batting stance, which was open with his left foot facing toward third base. Simmons' 1933 Goudey demonstrates his famous stance which worked just fine for him as he batted .331 for the White Sox that year. 1929 R315 Al Simmons HOF Philadelphia Athletics NO Creases!